Award Winning Hotel & Restaurant is widely acclaimed in all the major guides for its culinary expertise. Quietly situated with fantastic views of Derwentwater and the surrounding mountains. Only a few minutes walk from the town centre and the lake. 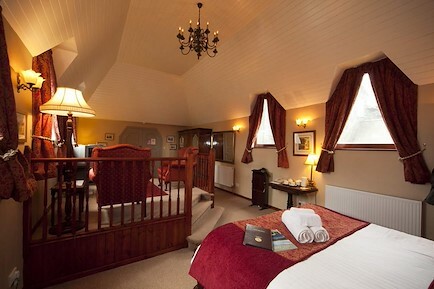 The Highfield Hotel has 18 comfortable en-suite bedrooms. All non-smoking. Flat screen TV and DVD players, direct dial phones in all rooms, complementary access to the internet. The restaurant has an international team of chefs, serving an extensive menu using the best of Fresh local produce. From the M6 Motorway: Take the A66 West, signposted Keswick, for about 17 miles. As you approach Keswick, ignore the first signs from the A66 and go on to the second which is at a roundabout. Turn left at the roundabout and go to the end of the road then left at the T-junction and right at the mini-roundabout, signposted 'Borrowdale'. Follow this road round to the left and you will see The Heads shortly on your right. for the car park, immediately after you turn into The Heads, turn right again behind the Hazeldene Hotel and keep going until you see the sign for Highfield car park. Your enquiry will be sent directly to The Highfield Hotel . Please fill in as much detail as you can.